"Like Billy Eckstein Singing to an Empty Night Club at 1:00 AM on a Saturday Night in 1975." "Like Billy Eckstein Singing to an Empty Club at 1:00 AM on a Saturday Night in 1975." Sometime, around my twenty first year, about 1975, my mother-in-law and her boyfriend called and asked my wife and me, if we wanted to go see Billy Eckstein, playing at a local club. The place was nice, the food, good, and there was no cover charge. Being a budding young jazz musician and fan—following a decade of playing rock & roll, blues, and soul music—I understood Eckstein’s importance, both as a singer (his nickname was The Sepia Sinatra) and, as a bandleader, leading what could arguably be called the first bebop big band, featuring a young unknown Dizzy Gillespie and Charlie Parker, both of whom were on the cusp of a genuine musical revolution. 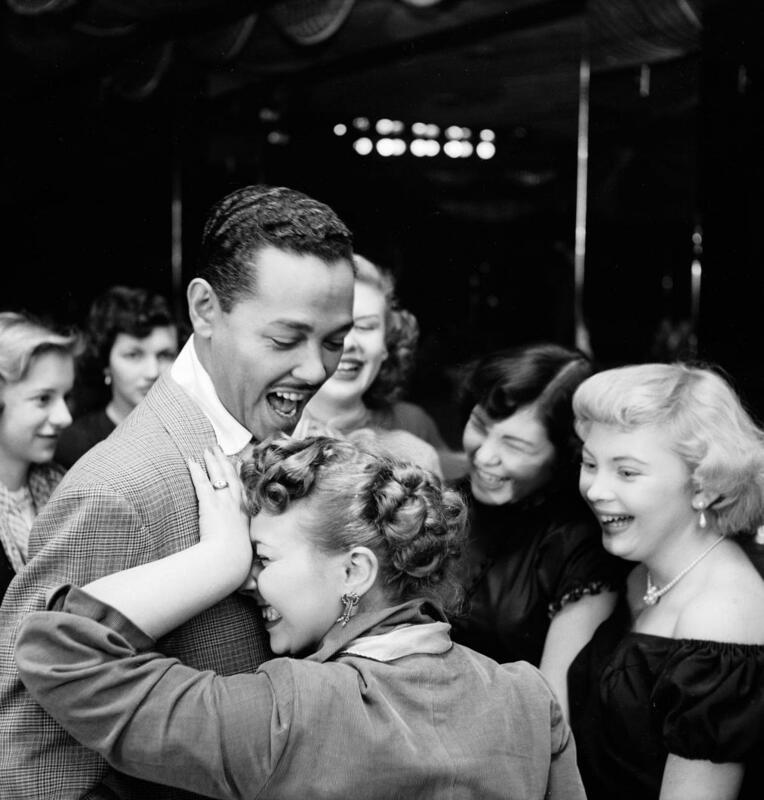 Billy Eckstein became a star in the 1940’s and continued to be one well into the 1950’s. He was a very big star, relatively speaking, but should’ve been even bigger. The color bar limited his reach, as it for did so many other Black musicians in pre-civil rights America. Even so, Eckstein sold millions of records, got rich, and introduced a young, largely unknown Sarah Vaughn to the world as his singing partner. Vaughn was one of the 3 or 4 greatest jazz vocalists in the history of the music, and a perfect foil for Eckstein’s blues, jazz, and pop-based vocalizing. And then, as rock & roll supplanted everything else, he faded from the spotlight, as musical styles changed and Eckstein’s rich, mellifluous baritone, gave way to a less formal, more urban, yet church-based style of singing. By the time I saw Billy Eckstein, he was in is his early sixties, but still handsome, with a voice that had aged well, and, if anything, was deeper and more expressive than it had been in his prime. His band was comprised of piano, sax, electric bass, and drums. If memory serves me correctly, they were all White, and somewhere in their 30’s maybe, early 40’s, young enough to be Eckstein’s children. By the early 1970’s, jazz wasn’t completely dead, but it was close, as the stunning and unexpected success of rock & roll marginalized virtually everything else. Sinatra, for instance, could sell out “The Sands,” in Las Vegas, for his full two-week stint, easily enough. That was considered big in the America of the jazz age. By the time Elvis went into the army, in 1959, he’d sold a billion records, that was in 5 short years. In 1971, Grand Funk Railroad sold out Shea Stadium in 72 hours, playing to a crowd of 60,000. Clearly, even the biggest of yesteryear’s, stars, paled by comparison to rock & roll’s new hit-makers. At least, in terms of dollars and cents. In pop music, nothing else much matters. By the 1970’s, most of the young players taking up jazz tended to be White, as young Blacks shifted to Soul music, the contemporary Black music of the 1960’s and 70’s. It was also where the money was. The late sixties and seventies was the beginning of the era of academic jazz programs in colleges. Academia took the place of local musicians and teachers, who'd previously shared new forms of music, created in local neighborhoods, clubs, and churches. Meaning, just as jazz had lost its financial luster, it got respectable. Jazz went to college, where it became the breeding ground for a new generation of predominately Caucasian musicians, who loved, preserved, and played the music, offering their own fresh perspective, while still being firmly rooted in the tradition. Rather than seeing these musicians as cultural appropriators—a term I find pathetically anti-intellectual—these White kids loved the music and were eager to keep it alive, at a time when almost no one else did. It was equally true of the blues, which had been ignored by younger Blacks, who no longer wanted to sing about slavery or hard times. Times were hard enough. But they were, in post-war America, beginning to look up. There were exceptions, of course, but opportunity was quickly becoming the norm. The Rolling Stones, for instance, made a helluva lot more money than Muddy Waters ever did, or any of the other Black Bluesmen, and they obviously did appropriate the music. However, you could just as easily say that Muddy Waters thrived in a way that he never would without the success of The Rolling Stones and other groups, who revered the man, and said so, in virtually every interview they ever gave, offering Muddy a platform that wouldn’t have existed, otherwise. Arguing for some abstract version of fairness, then, which does not exist, will never exist—certainly not by giving power to politicians to legally enforce some politically motivated notion of fairness, won’t change that one damned bit. It will only empower politicians to make all of us poorer, and less free, as the result. Eventually, The Rolling Stones found their own way, their own version of the music, which was as much theirs as any of the older generations of musicians. That’s how traditions are passed on. Not by freezing the music at a moment in time, so some group of enlightened children will determine who gets what, by calling it cultural appropriation and defining everything in terms of race. Anyway. Before I get too far afield, Billy Eckstein and his band took the stage at about ten o’clock, and played for the next hour and a half, playing a set of old hits, jazz standards, and blues. The band was tight, but relaxed, giving Eckstein a full enough musical pulpit from which to range. After the set ended, Eckstein and band took a 45-minute break, which I used as an opportunity to talk to some of the band members who were friendly and supportive of a young guy learning to play the music. In that sense, they were very different than most of the rock musicians I knew, who thought of themselves as stars, if not in the present, they would be, soon enough, and they acted like it. In the rock & roll of the era, there was a lot of posing, sneers, and puckered lips—Mick Jagger style. There was glitter and spandex, with shag haircuts down below the shoulders, and amplifiers big enough and loud enough to shatter the eardrums. By comparison, Eckstein’s band was almost acoustic. By the 2nd set, the club had largely emptied out. There were, maybe, a dozen or so people, left, including us. This prompted Mr. Eckstein to pull out his Les Paul guitar, a Black Beauty was the model, (No racial meaning intended,) sat down on a stool and sang and played the blues like it was 4 AM in an after-hours club in 1940s Kansas City, when Rhythm & Blues was a brand new music; part jazz, part urban blues, with a hint of country blues. The kind of music which, for White-folk, was uncommonly sensuous and provocative—and so was Mr. Eckstein, who played slow blues and ballads for the rest of the evening. Something not generally done live, in clubs, where expectations are geared to dancing and sexual repartee among a younger clientele looking for the hook-up. It was the fact that the audience was so sparse, that allowed Mr. Eckstein to play it like he felt it. The kind of performance that I will probably never see again, but for an aging performer left to their own preferences, playing out their contractual obligation, to a sparse and very fortunate crowd. This was music as life. Not music as entertainment. We were spectators to a private showing of an old man’s artistry, in the wee small hours, nestled a few feet from the stage, like we were in Mr. Eckstein’s living room. Today, I’m about the same age Billy Eckstein was, then, some forty plus years ago. And I understand how he felt. The energy may wane, but the artistry grows deeper. At least, that’s the hope. The raw energy of youth gives way to another kind of storytelling, more a sumptuous whisper in the ear, than a declamatory shout, a warm, intimate embrace, not showbiz, but a personal secret told to an old friend—one that you’ve just met for the first time. That was Billy Eckstein in the wee small hours. Long gone, but dutifully remembered.